Juice cleanses always sound good. You get to drink unlimited amounts of lovely juice and you cleanse yourself in the process, whatever that means. Of course, what many people don’t realise, is that if you only put liquid in your body, there’s really only going to be liquid coming out again. So, y’know, juice cleanses aren’t as fulfilling or clean as they might appear. One woman in China decided to get around the liquidy-brown embarrassment of a juice cleanse by going a bit rogue and just injecting herself with fruit juice instead, thereby bypassing her digestive system and getting the fruity nutrients straight into her bloodstream. The 51-year-old woman, from Guiyang county in Chenzhou, Hunan province, apparently had an interest in unconventional and homeopathic treatments. The thing is, she wasn’t ill or under the weather. The lady just decided it was time for a fruit boost straight to her veins. So she concocted a smoothie of around 20 different types of fruit, hooked up an intravenous drip and went to town filling her veins with the sweet, sweet fruit cocktail. Somewhat unsurprisingly, it didn’t go well. According to the South China Morning Post, despite a rising temperature and feeling itchy all over, the 51-year-old did nothing about her worsening condition for some time, until her husband noticed her obvious discomfort. 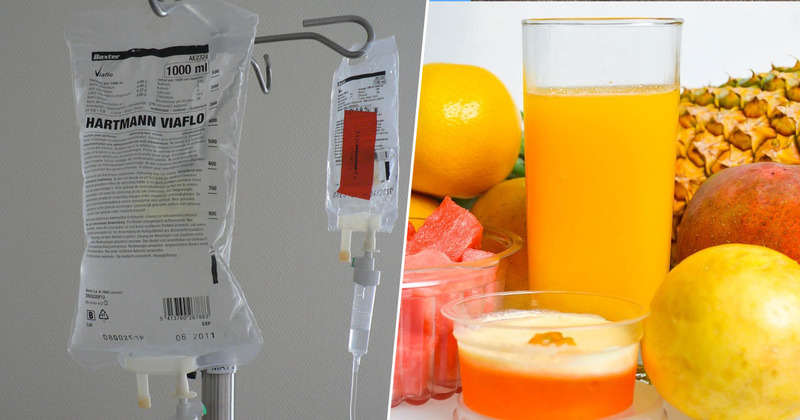 She admitted to him what she’d done with the fruit cocktail IV, and he took her to hospital where she was admitted to intensive care. According to the doctor who treated her, the woman (who was previously healthy) was now suffering from severe infection, damage to her liver, kidneys and heart, and was in serious danger of dying from multiple organ failure and sepsis. Doctors treated the woman and used dialysis to cleanse her blood, they injected clotting agents and gave her antibiotics. Thankfully, the woman’s condition improved greatly, and after five days she was transferred to a kidney unit to continue treatment. I had thought fresh fruits were very nutritious and it would not do me harm by injecting them into my body. I had no idea that would get me into such trouble. Well, it turns out plenty of fruit isn’t always a good thing, especially if you blend it up and inject it directly into your bloodstream. Everything in moderation I guess. Stick to your five-a-day and don’t inject any into your veins, please.